Scott Ryan as Puck in 'A Midsummer Night's Dream' at Barley Sheaf. Every year, the Barley Sheaf Players stage a benefit show in January to support a local charity or organization that provides services to people who need them. This year, it’s personal. This year, the Barley Sheaf community is coming together to honor the life of one of their own. Scott Ryan had an enormous impact at the Barley Sheaf Players, where he acted, directed shows, served on the Board of Directors, and contributed in dozens of other ways to the theater, exemplifying what it means to be part of a “community” theater. Scott first joined the Barley Sheaf Players as an assistant director for their production of Spider’s Web in the spring of 2006. When the director unexpectedly had to deal with a health issue, though Scott was brand new to this community, he stepped up and volunteered to helm the show while the director was out. He was always willing to help in any way that he could at a place that would become his home away from home. Shortly after this show, Scott starred in his first acting role at Barley Sheaf, as Puck in A Midsummer Night’s Dream. When Scott was diagnosed with Stage IV Melanoma this past summer just before his 34th birthday, he did not let even that stop him from volunteering his time at Barley Sheaf. The theater was in need of volunteers to paint the refurbished refreshment area, and Scott showed up with a smile on his face, ready and eager to help – despite the fact that he had just begun treatment. During the course of his treatment, Scott experienced partial facial paralysis, but he did not let that stop him from volunteering his time to serve as an usher for the theater’s fall show. Unfortunately, that would turn out to be the last time that Scott was able to visit the community theater that became his second family. On Dec. 3, Scott underwent surgery for tumors that had been growing in his head and causing complications. He experienced swelling in his brain and required a ventilator to breathe. When Scott’s condition worsened, the Barley Sheaf community quickly mobilized to care for their fellow actor, director, and friend. Some volunteered to watch his two young children, Lillyan, who just turned 5, and Artie, who recently turned 1. Others offered home-cooked food for the family. And on one special night, approximately 40 members of the Barley Sheaf community gathered at the theater to film a short video to let Scott and his family know that they were thinking of them. As the theater community gathered by the glow of candlelight, they sang James Taylor’s “You’ve Got a Friend” and sent messages of their love. Those who couldn’t be there in person video-called from their smartphones, so that they could tell Scott and his family that they were thinking of them. Sadly, less than one week later, Scott passed. The loss of Scott has been felt deeply by the Barley Sheaf community. To help support his wife and children – who are struggling not only with the loss of their husband and father, but also with the costs of his medical care for the past several months – the Barley Sheaf Players are staging a benefit show, with all proceeds being donated to the Ryan family. 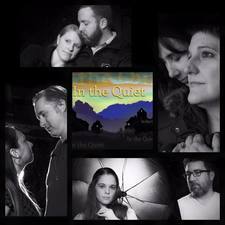 The play, "In the Quiet," is an original work written by Barley Sheaf member Andrea Grinwis, who is also directing the production. The play centers on the residents of a small, rural town and is comprised of eight short vignettes. The format is similar to the film "Love Actually," in which separate characters and storylines eventually interweave, bringing together neighbors, relatives, and friends as they face fears, struggle against despair, and stumble upon joy over the course of a single winter’s night. "In the Quiet"runs for two weekends -- Friday and Saturday at 8 p.m., from Jan. 15 through 23. Seating is general admission. There are no set ticket prices – audience members are asked to make as much of a monetary donation as they would like for the Ryan family at the box office in exchange for a ticket. The box office opens at 7:30. Seats are available on a walk-in basis, or call the box office at 610-363-7075 to request a reservation. More information is at www.barleysheaf.org. For those who cannot make the show but would still like to donate, visit their Give Forward page at www.giveforward.com/fundraiser/c7z9/support-for-scott.